Happy New Year and Merry (almost) Epiphany! In celebration, these three wise women are stopping by with a gift for you. 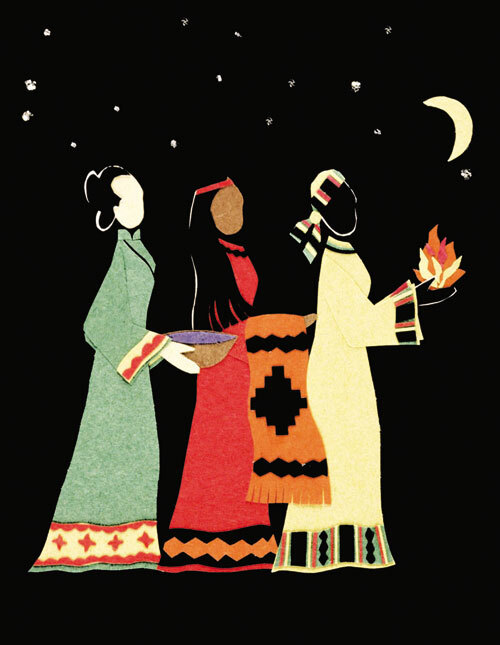 You might know that some folks celebrate Epiphany (January 6) as Women’s Christmas. Originating in Ireland, where it is known as Nollaig na mBan, Women’s Christmas began as a day when the women set aside time to enjoy a break and celebrate together at the end of the holidays. It’s become a tradition for me to create a new retreat each year that you can use on Women’s Christmas or whenever you need a space of respite and reflection. The retreat, which you can download as a PDF, offers readings, art, and blessings that invite you to listen to your life. Read Jan’s whole post (and download the retreat) here: Women’s Christmas 2015 – A Gift for You « The Painted Prayerbook.